The quarterback battle going on in Eugene has certainly received its share of local and national press, and justifiably so. The Ducks are replacing the single greatest player in program history, who also happened to occupy the single most important position on the field. While I do not want to diminish the importance of this position — indeed, Oregon cannot expect to repeat as Pac-12 champions with poor quarterback play — I do not believe it is the critical factor in determining the heights to which the Ducks will soar this season. 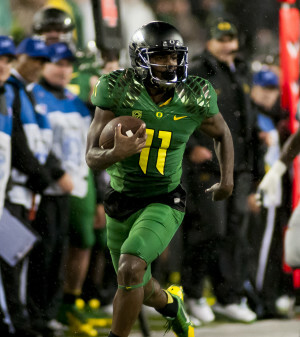 The return of Bralon Addison makes Oregon’s offense more potent in 2015. Oregon has essentially every major skill position contributor back from last season; and Bralon Addison, who was honorable mention all-conference in 2013, returns from injury. Up front, the Ducks have two bookend tackles in Tyler Johnstone and Tyrell Crosby, a three-year starter in Cameron Hunt, and a proven player in graduate transfer Matt Hegarty. The Duck coaching staff will also tailor the offensive game plan to put less on the quarterback’s shoulders, emphasizing the run more on first and second down. There will also be more quick throws that allow for simpler reads, thus pushing the heavy lifting from the quarterback to the skill player. As long as Oregon’s quarterback can efficiently manage the offense and allow the plethora of Duck playmakers to simply do what they do in space, Oregon will be just fine offensively in 2015. 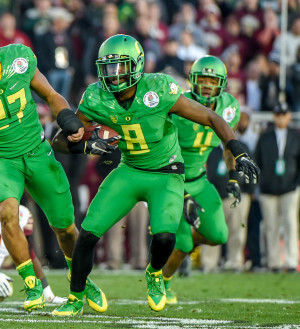 The key to the height of Duck success in 2015 lies in on the “other” side of the ball. Yes, the Oregon defense will determine whether this team returns to the College Football Playoff, or whether it becomes just another in a long line of “good, but not memorable” teams across every blue-blood college football program. With the talent on board in Eugene, the Ducks have, for perhaps the first time in many years, a legitimate shot at producing an elite defense. Question marks and inexperience, however, still dot the depth chart, and those issues will need to be resolved. 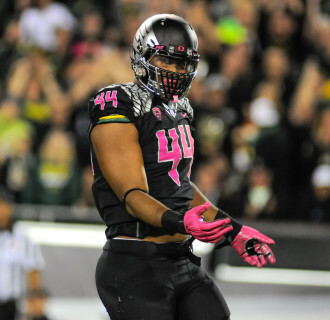 DeForest Buckner is the catalyst for the Oregon defense. The biggest reason for optimism on defense is up front. DeForest Buckner returns as one of the top defensive lineman in the nation after leading Oregon with 12.5 tackles for a loss last season. ESPN’s Mel Kiper pegged Buckner as the 23rd overall NFL draft prospect for 2016. Senior nose tackle Alex Balducci has also been discussed as an all-conference candidate. 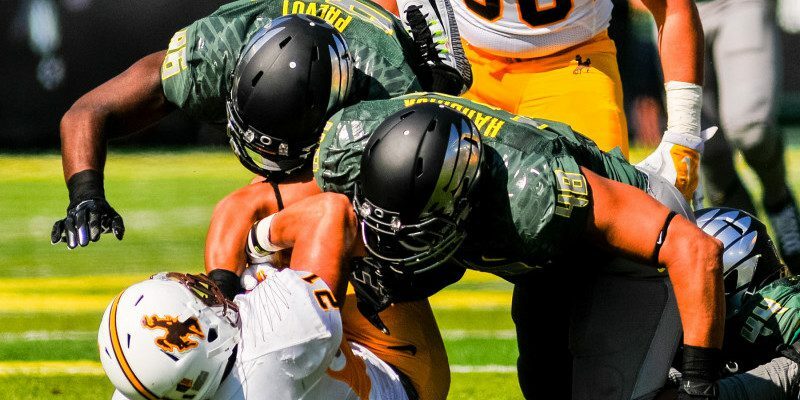 Rounding out the front is likely Tui Talia, a very highly-rated JUCO player now in his second season in Eugene. Other possibilities include T.J. Daniel or true freshman Canton Kaumatule, among others. If the defensive line can become a truly special unit as Prehm indicates, the linebackers and defensive backs become much better players. This is doubly important when question marks exist along the back seven, as they do with Oregon. At the linebacker level, Tyson Coleman returns on the outside after a very solid but banged-up junior season in which he posted 44 tackles. After speaking with Coleman this spring, 247sports.com declared him ”100-percent” healthy heading into fall camp. He should be in line for a big senior season. On the other side, Christian French has been a bit of an enigma but seemed to turn it on late last year, eventually leading the Ducks with 6.5 sacks. He could be in line for a strong finish to his career, but is still somewhat of a question mark as an every-down player. Torrodney Prevot is also a possibility here if he can become more consistent. On the inside, if Joe Walker takes even a small step forward this year, he will be manning the all-conference first team. Rodney Hardrick returns for his third season starting in the middle, and while he is dependable against the run, he has flaws in space and in coverage. The coaching staff knows what they are getting from Hardrick, but many fans would love to see Danny Mattingly or Jimmie Swain earn more snaps in the middle, as both are more dynamic athletically. I see two of the four linebacker spots locked in with players primed for big seasons in Coleman and Walker. The other two spots have the potential to see high-level production given the talent on the roster, but potential is only potential until realized. Time will tell whether and who among French, Prevot, Hardrick, Mattingly and Swain is ready for prime time. Reggie Daniels will anchor the Duck secondary this season. Per the Oregonian’s Andrew Grief, safety play should be solid with defensive coordinator Don Pellum’s ”elder statesmen” of the secondary, Tyree Robinson and Reggie Daniels, whom Pellum will count on for leadership this fall. Daniels finished third on the team with 83 tackles in 2015, and particularly impressed me toward the end of last season, when he seemed to be all over the field in both run support and in coverage. Things get a little interesting at corner. There is certainly plenty of potential, but again, potential is not useful until it becomes realized. That is the funny thing about this Duck squad. There is more natural physical talent on this roster than any in Oregon history, and yet, question marks remain. Chris Seisay, Arrion Springs, Charles Nelson, and Ugo Amadi could become the most feared group of cornerbacks in the conference by November, or they could be a complete liability all season. The only way to find out is to turn on the lights at Autzen Stadium and tee up the football. Can Oregon’s defensive playmakers live up to their billings and create a fast, athletic blur that makes even the Duck offense green (and yellow) with envy? Or will youth, inexperience, and a lack of confidence ultimately rear their collective ugly heads? We will get our answers this fall. I know I will be watching, and rooting, intently.